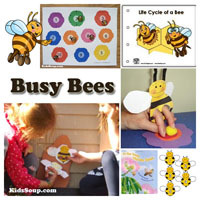 Bees crafts, activities, games, and printables for preschool and kindergarten. 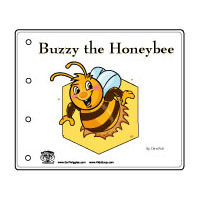 What's the buzz all about? It's about BEES. What would we do without these little creatures? They provide us with honey and they pollinate flowers. 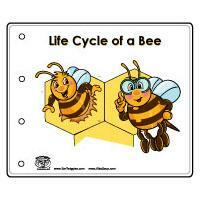 And they are like humans in many ways: bees have jobs, bees make bread, and bees like to dance. 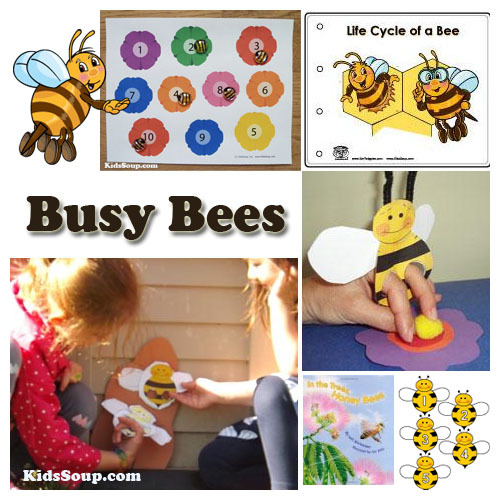 Our educational bee-related crafts, activities, folder games, rhymes, and resources will provide your child with hours and hours of learning and fun. Block Center: Add silk flowers and bee counters. 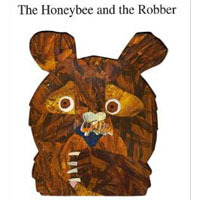 Let children make a meadow and build a bee house. 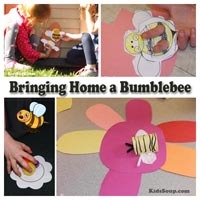 Dramatic Play Center: Cover a table with a yellow bed sheet to make a beehive. Place some silk flowers with yellow pom-poms around the outside of the hive. 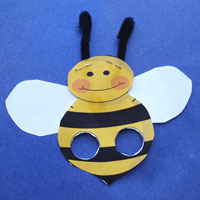 Let children pretend to be bees collecting nectar to bring back to the hive to make honey. 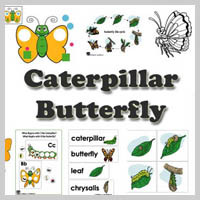 The children can carry the yellow pom-poms to the different flowers to pollinate them. 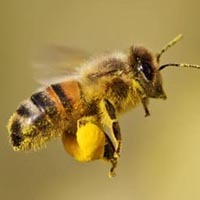 Honeybees are social insects that live in hives. 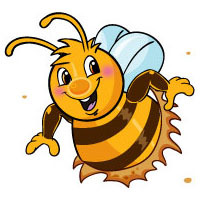 Like all insects, bees have six legs, a three-part body, a pair of antennae, compound eyes, jointed legs, and a hard exoskeleton. The three body parts are the head, thorax, and abdomen (the tail end). 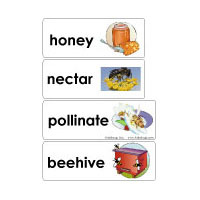 Bees eat nectar which they turn into honey. 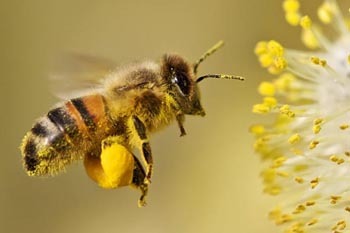 As the bees fly from flower to flower to collect nectar, pollen from many plants gets stuck on the bee's pollen baskets (hairs on the hind legs). The pollen gets rubbed off on other flowers which pollinates the flowers (fertilizing them and producing seeds). The queen lays an egg in a cell in the wax comb. 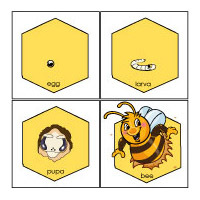 The egg hatches into a worm-like larva, which eventually pupates into an adult bee. Decorate a plastic cup with bee and flower stickers. Plant some flower seeds. 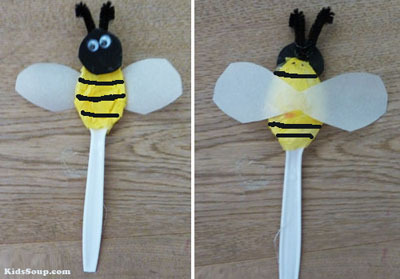 Glue a bee cut-out to the top a of a craft stick to make a plant stake. Give each child a piece of paper. Let them draw or paint some flowers on the paper. 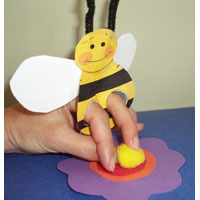 Have them press their finger into paint or ink to make fingerprint bees. 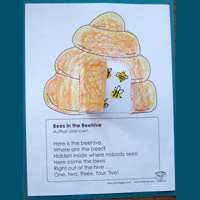 Decorate the bees with markers or crayons. 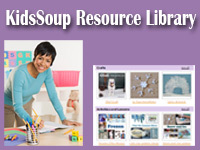 Give each child a piece of card stock paper. 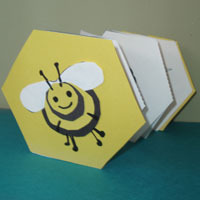 Let children glue Honeycomb cereal onto the paper to make a beehive. Blow up a small yellow balloon for each child. Have children draw eyes, mouth, and stripes with a black marker. 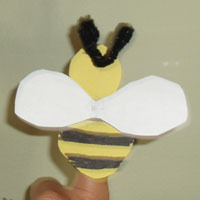 Let children fly their "bees" around the room to the "Flight of the Bumblebee" by Rimsky-Korsakov. Make a bingo game board up with numbers 1-12. 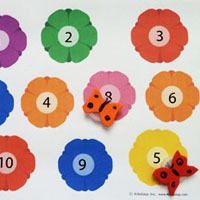 Each square has a flower in it and the number in the center of the flower. 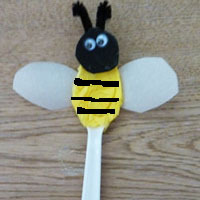 Spray paint small pebbles yellow or use yellow glass gems and draw some black strips to make some bees. 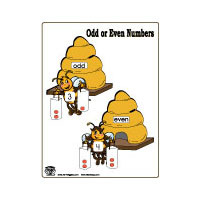 Call out a number and let children place a bee on the flower with the matching number. 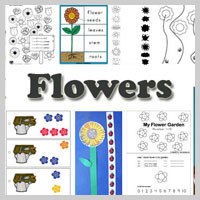 Print out the flower patterns onto different colors of card stock paper and cut out. 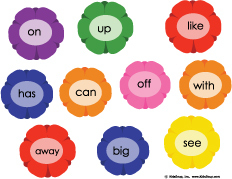 Write a sight word on each flower. Write the matching sight words on some cards. Place the word cards in a pile. 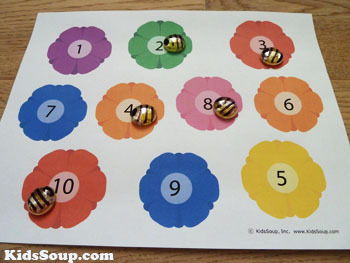 Have children take turns turning over a card, read the word, and then place a bee counter on the matching flower. Print out the flower patterns onto different colors of craft paper and cut out. Write three different letters on the flowers and place the flowers all over the room. Have children buzz around the room like bees. 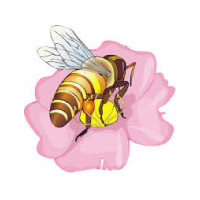 Call out a letter and let the bees look for that flower with the letter, grab it, and bring it back to the circle. Repeat with the other two letters. 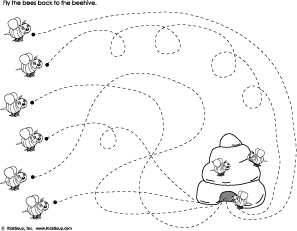 Variation: Let children place the flowers in a beeline to the hive (circle). 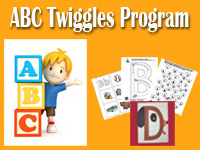 Let children buzz around and follow the beeline in to the circle. With children, plant flowers that attract bees such as Black-eyed Susans, lantana, and zinnias and herbs such as lavender, basil, and sage. Learn about honey. Visit PBS.org for some fun facts. Place some flowers on the walls. Children sit in a circle on the floor. 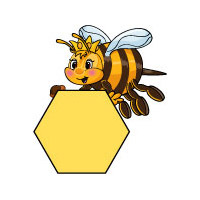 The Queen Bee walks around the circle tapping children on the head and saying, "Buzz, buzz, buzz" with each tap. Each child tapped gets out of the circle and follows the Queen around. 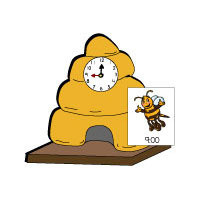 When the Queen calls, "Go make honey," those tapped and the Queen bee run off to the flowers on the wall. Choose a new Queen Bee. Number two said, "Tell me, where shall it be?" (Bend down second finger). Number five said, "Let's take it on our feet." 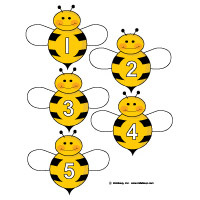 To reinforce the parts of a bee, play this fun game with your children. 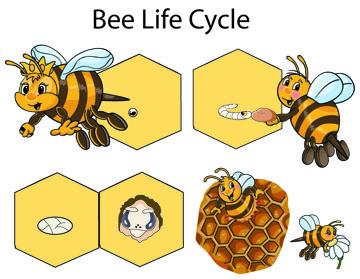 Have children sit in a circle and let them pretend to be little bees in a classroom. 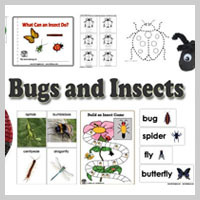 Explain that the little bees will learn about their body parts and as soon as you ask them about their wings they can fly around the room until the school bell rings (demonstrate the little bell ringing). Call out "Where are my bees?" Let children stand up and say, "Here we are!" Ask, "Where's your head, little bees?" Children point to their heads and say, "Here's my head." Ask, "Where's your thorax, little bees?" Children point to their chest and say, "Here's my chest." Ask, "Where's your stomach, little bees?" 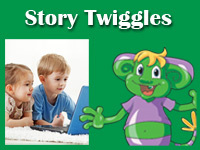 Children point to their stomach and say, "Here's my stomach." Ask, "Where are your wings, little bees?" Children flap their arms and say, "Here are my wings." And let them fly around until you ring a bell to gather back in the circle. Repeat with other body parts such as eyes, tongue, and legs. When you say,"Where are your wings, little bees? ", let the little bees fly around in the room. Hide different silk flowers somewhere in your room. 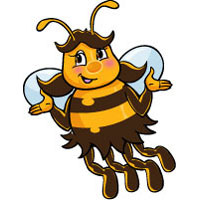 Eplain to children that bees communicate with each other using a dance. 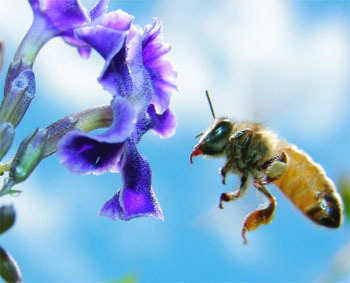 If a bee finds a source of food, the bee will fly back to the hive and tell the other bees how to find the flower. 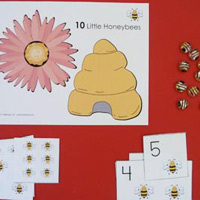 Choose one child to pretend to be a bee and instruct the child how to find the flower. Use words like forward, to the right, to the left, behind, above, under, etc. Then let the child go and find the flower and show it to the group. Go around the circle and tap one child on the shoulder. Repeat until all children have said their name. Then say, ("Hi Lana!") and clap two times. Note: Before you serve any honey snacks check for honey allergies. Mix honey, peanut butter, powdered milk, and graham cracker crumbs in mixing bowl. Form mixture into 2-inch diameter balls. Chill if desired and then eat. Now he's on my nose. He lands and then he goes. Do You Like To Buzz? Are you covered all in fuzz? In the garden where you roam? Do you know how to make honey? Are your stripes a little funny?